On October 1, 2013, the Caulk Dentsply Company began shipping the Caulk AquasilUltra Cordless Impression System. Dr. Gerard immediately recognized it as a potential revolution for the dental industry and ordered this new system for taking highly accurate dental impressions. If you've ever had a crown made in the past, you may recall when the Dentist or his staff had to "pack cords" before taking the final impression. Until now, this has been an essential part of accurately registering the shape of the teeth for the lab to fabricate the new crown or bridge or veneer. 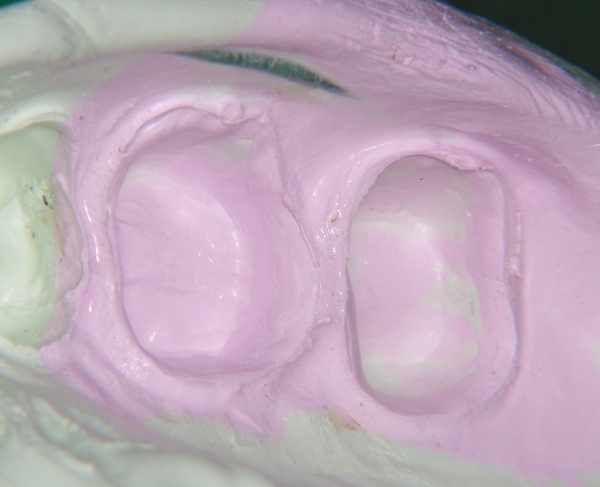 The process involves gently tucking a thin braided thread just under the gum tissue around the tooth being worked on. The thread, or "cord" as we call it, is usually impregnated with a medication that temporarily causes the small blood vessels within the gum tissue to contract. This, in turn, controls any bleeding and causes the gum tissue to temporarily shrink away from the tooth very slightly, thus allowing the impression material to freely flow around the entire tooth during the impression process, giving a nice, clean impression. This process of placing the cord would normally be fairly uncomfortable for the patient, so, until now, we have usually numbed the area up. The gum tissues usually return back to normal within a few minutes, but can be sore for a day or 2 after the impressions. If extensive work is being performed on many teeth at the same time, there may have been significant post-operative discomfort for several days. This has now all changed! On October 1st, 2013, with the release of the Caulk AquasilUltra Cordless Impression System, the need for most packing of retraction cords has been eliminated! 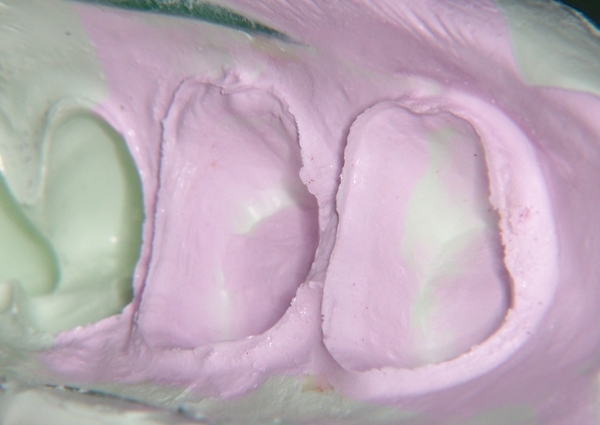 By reformulating the impression material and delivering it through a fine tip under pressure, the impression material is able to be placed under the gumline without the need, in most cases, to mechanically displace the gum tissue! This means if you are having veneers or crowns, no more packing cords! And Dr. Gerard is one of the only Florida Dentists offering this revolutionary system. The photos below show ultra-close-up actual impressions taken by Dr. Gerard on real patients. 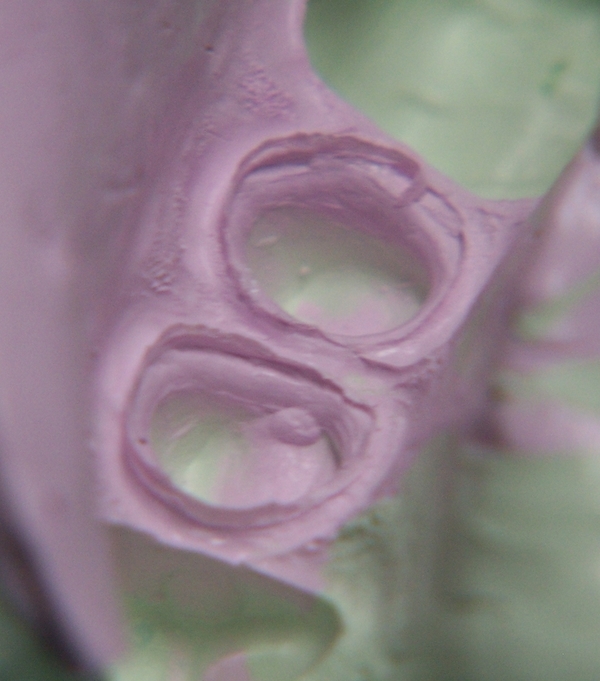 Notice the fine "fins" of impression material surrounding each tooth. This shows how the pressure of the new delivery system has directed the impression material under the gum without the need for mechanical retraction! 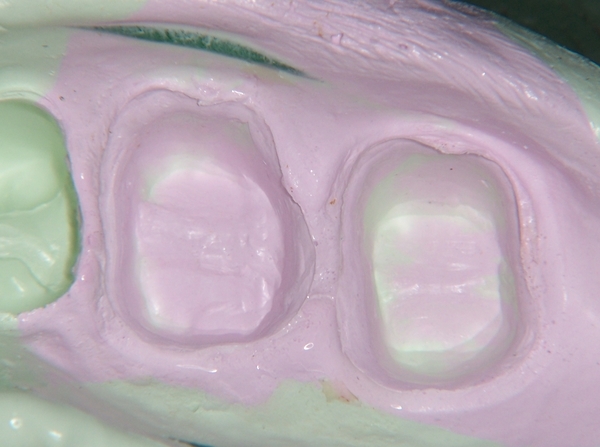 The laboratory can clearly see the "finish line" of the tooth preparation. Previously this was only possible with some form of mechanical displacement of the gum tissue immediately before taking the impression. ... and if the tooth itself is not sensitive - such as with an Endodontically treated tooth - no anaesthesia is required at all!